Can I get my bingo cards back? I was disconnected. You can go back to bingo round that you were playing if you refresh or load again. You don't lose your bingo cards and marks, but you should go back to your room quickly so that you don't miss out number calls. If you want more infomation on DoubleU's Bingo, please click here. "Disconnected from server" occurs frequently. Can you help? Connection lost pop-up comes up when your connection has been lost. Connection lost can happen due to a number of factors. 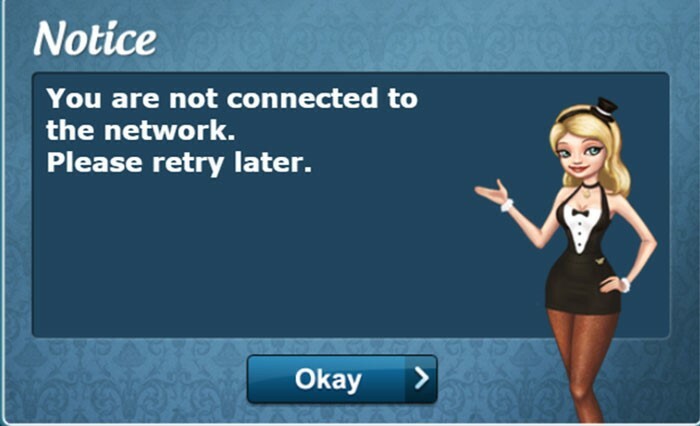 One of three notice pop-ups inform you of the factors that resulting connection lost occurred to your game. This pop-up indicates that your connection has been lost by another login into your account from another browser, browser tab, or computer. 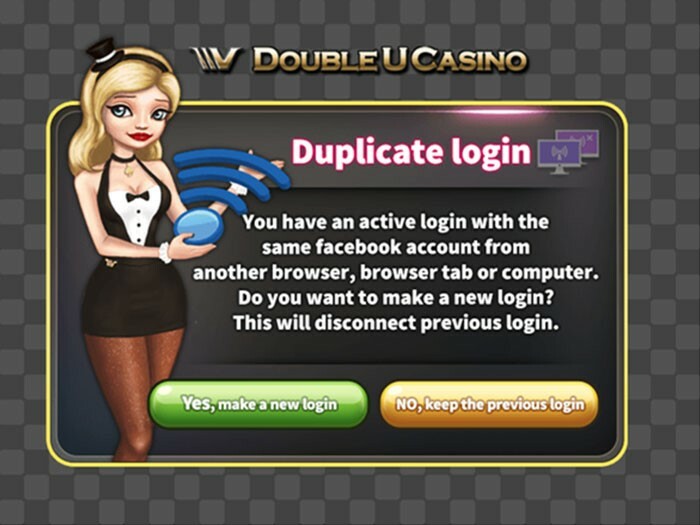 In DoubleU Casino app, only one login is allowed per user account at a time as stated on the pop up above. • Click on the link to the same app page. 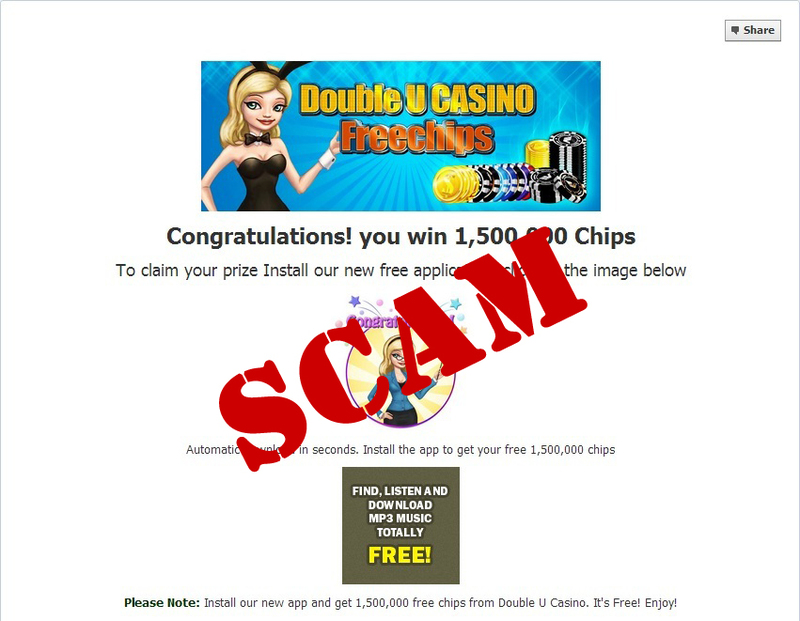 If you click on one of the links to DoubleU Casino app on free chip event post, bonus feed on your news feed, or any other post while playing the game, you will be logged out of the first client (game) because the link loads another client into your web browser's tab. Therefore, it is recommended that you refrain from collecting bonuses from the feeds while playing game. • Another login into your account and game loading from another computer or device. In this case, you'll be logged out of the game immediately. Account abuse caused by security breach is also a core factor. You and another person may attempt to log into the game competitively, so connection lost would occur repeatedly. • Multiple loads of games into multiple browsers or browser tabs by mistake. You might load more than 2 game clients into a single web browser or browser tab by mistake or accident. In this case, the first session will be closed immediately. This pop-up means that your session has been closed due to the instability on your network or the server. provider to check out your internet status. Wireless LAN is more unstable than local internet service, so network disconnection may occur more frequently. The frequency of connection lost may differ according to the status of wireless LAN service nearby. Computer locking is a security measure that is common for all Windows Operating system. Whether your computer stays idle for a specific time, or you lock it by yourself by pressing specific combination of keys. The computer becomes "locked" and you have to enter your user name and password to unlock it. 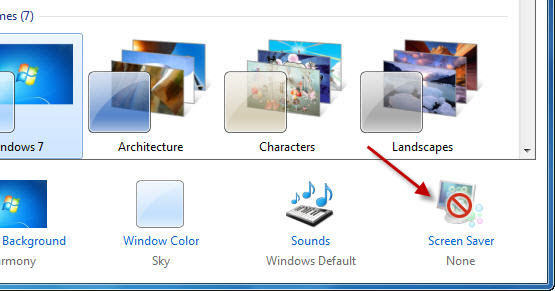 In Windows 7 / Vista, auto-lock disconnects your PC from network, so your game could be disconnected frequently if you selected this option. To prevent this, you're strongly recommended to follow these steps. 1. Right-click the desktop and select "Personalize". 3. Deselect "On resume, display logon screen" check box to disable auto-lock option. 1. 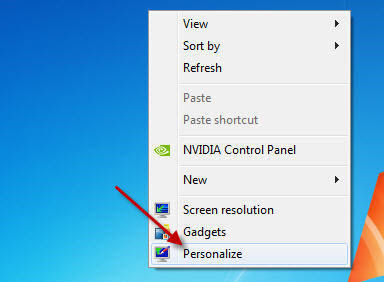 Right-click the desktop and select "Personalization". 3. 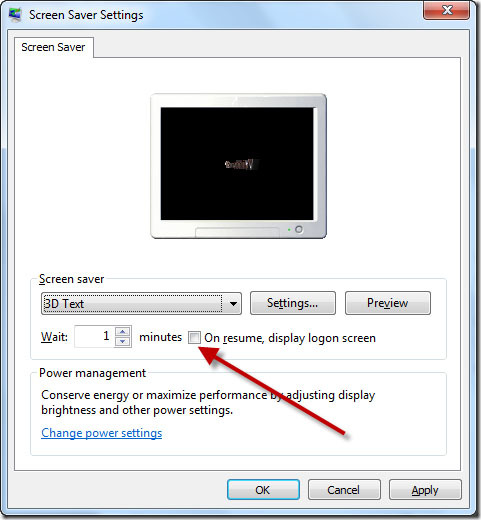 Click on the “Screen saver setting” button. 4. Deselect "On resume, display logon screen" check box to disable auto-lock option. By this setting, you can prevent disconnection occurred by a long-time "idle" status. To activate screen lock after the specific time of "idle", please increase the amount of minutes in "Wait" box. However, you're recommended to be careful in using this setting because another person might use your PC while you're staying out of it. This is only a guideline to prevent disconnection, so DoubleU Casino has no responsibility or liability for any possible security breach caused by disabled auto-lock option. breakdown, malfunction, erroneous management, or any other factor. It rarely happens, but it might happen. We try our best to notice you the maintenance in advance. Most of the time, it's temporary. So, please you click on "Rejoin" button in a moment to go back to your game. 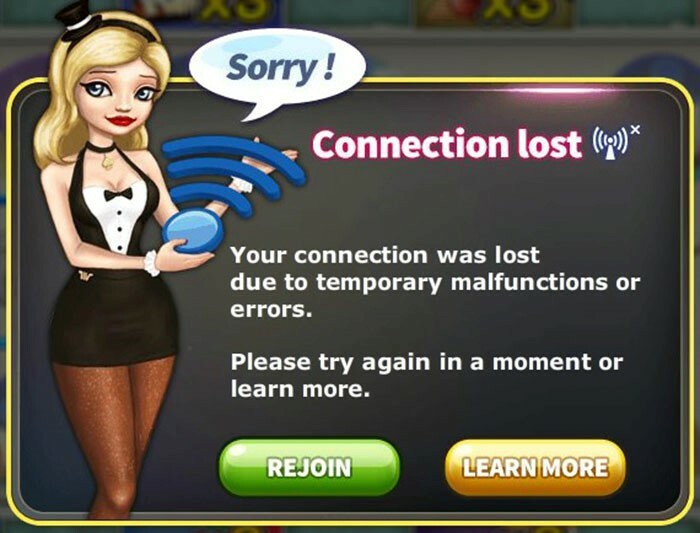 We have several countermeasures to protect your free spins, hands, payouts or any other item from connection lost. For example, in slots, you can directly go back to your bonus round without losing free spins if you click on either "Rejoin" button or refresh on your web browser after connection lost. The data on your game is stored to "Local storage"(click to learn more) in your computer if your PC's local storage is not disabled. - In table games, your round proceeds while you're reloading. So, It is recommended that you hit "Rejoin" button immediately to join your table and play it again. How do I check my purchase history? This is how you can attach receipt of your payment. 1. Left-click on the reverse triangle on the right of "Home" button on your homepage. 2. Click on " Payments" on the left, and click on "view". 3. Click on the number of amount below "Amount". 4. You can check the receipt of your payment. Your purchase would've been made only if "DoubleU Casino" is indicated on the right of "App"
5. If you want to learn how to take a screenshot of the receipt, please click the link below. This is how you can take a screenshot. Press the "Print Screen" button. Open Microsoft Paint. To do this, click Start > All Programs > Accessories > Paint. Click inside the white part of the screen. Go to the Edit menu and select Paste. In the box that pops up, change the "Save As" type to JPG. After typing in a filename for your image, choose a location on your hard drive to save to, like the Desktop, and click "Save." Simultaneously hold down the ⌘-Shift-4 keys. Click the open window that you wish to take a screen shot of. The screen shot should appear as a file on the desktop labeled "Picture 1." Please note that in Mac OS X 10.6, the file is "Screen shot [date] at [time]." Please click on one of the following links to learn how to clear your web browser cache and cookies. If your web browser is not stated above, please visit Google and enter "(the name of your web browser) clear cache and cookies" into search box and press "google search". My account is hacked. Can you help? Hacking issue can happen due to a number of factors. Please note that our system is not vulnerable to security breach attempts by small hacker groups because DoubleU Casino tech team is equipped with high-level security measures. 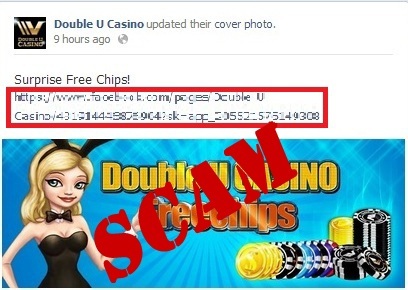 To prevent hacking or account abuse, DoubleU Casino support team have been trying to give recommendations to players. The followings are how your account is hacked or the reasons why you may think your account is hacked. 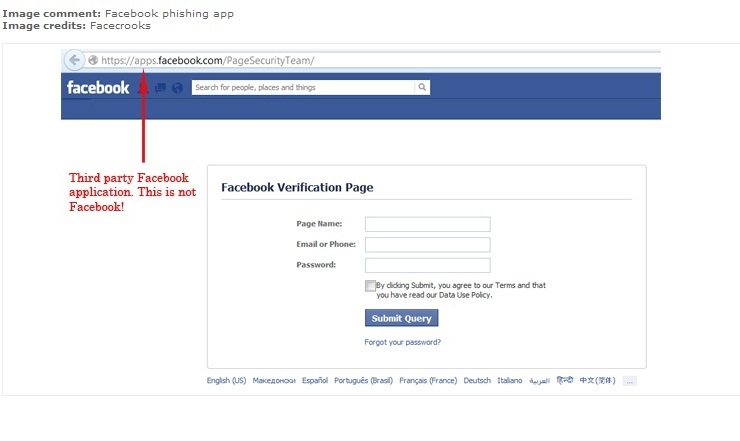 Some of facebook users try to phish your account information by using fake message, e-mail, post, app link, etc. If somebody requires your facebook account or password, it is strongly recommended that you do not respond to these phishing attempts. The pictures above are examples of attempts trying to phish your account information. 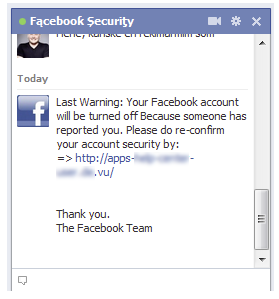 "Facebook Security" is a fake facebook name and has not to do with Facebook security team. You should NEVER send any information required by this message. If you already sent the account info and your account was abused, it is strongly recommended that you change password immediately, and report it to security section on Facebook Help Center. 2. Misuse of auto-login option on public PC. 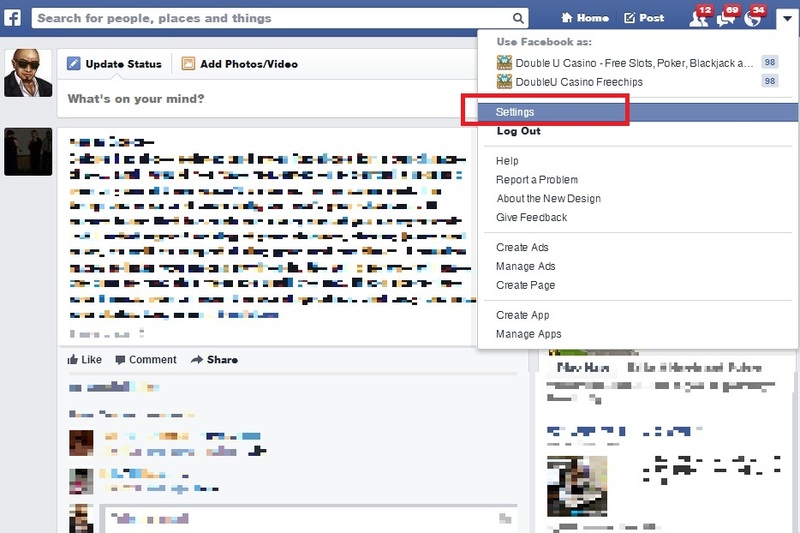 It is strongnly recommended that you deselect "keep me logged in" option when you log into Facebook in public PC. Please note your account may possibly be abused by another person using the PC next. Security issue can sometimes happen due to account shares. Please note that purchase or any changes in your account(including chips, missions, level, status) can be made by the people you share your account with. In this case, please ask them first whether he or she logged in your account while you're logged out. Connection lost issue is closely related to account shares too. You are immediately logged out of the game(session) when another login attempt in your account happen from other devices. Please refer to the FAQ(click to learn more) on connection lost by logins from other devices. In DoubleU Casino app, only one login is allowed per user account at a time. Therefore, you will be immediately logged out if another login into your account is made from another browser, browser tab, or computer. If you click on one of the links to DoubleU Casino app on free chip event post, bouns feed on your news feed, or any other post while playing the game, you will be logged out of the first session due to another load of game into web browser's tab. Please refer to the FAQ(click to learn more) on connection lost by this issue. I was hooked by a scam fan page. Can you help? 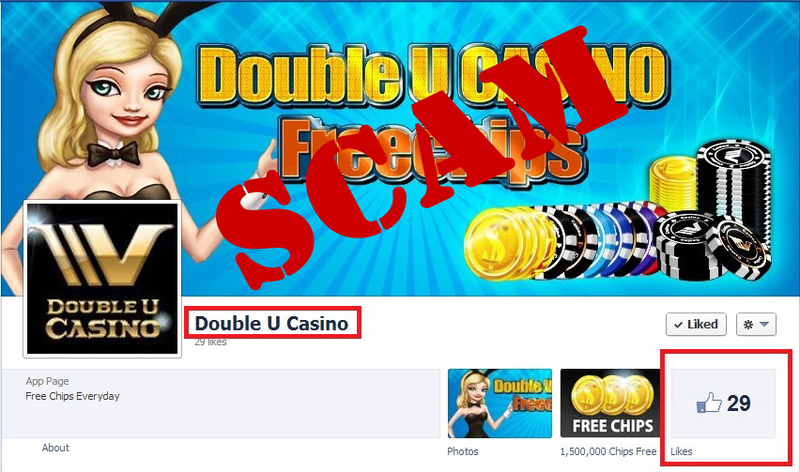 DoubleU Casino support team has been trying to keep track of scam pages copying our Fan pages, and a new scam page has been found recently. It copies the cover photo and the profile picture of our FreeChips page, which is easily done by "copy and save". More scam pages could possibly be created, but we have no authority to close down those scam pages forcefully. Therefore, it is strongly recommended that you beware of these pages, and we will give you an alarm through a security alert post on our fan pages to prevent more damages. Please note that DoubleU Casino Fan page and FreeChips page (click to visit) are the only official fan pages of DoubleU Casino. If you find any scam page of DoubleU Casino, please report it to us through Security/Hacking section on Help Center(click to visit) to prevent more damages. The pictures below show you an example of scam pages trying to hook you. 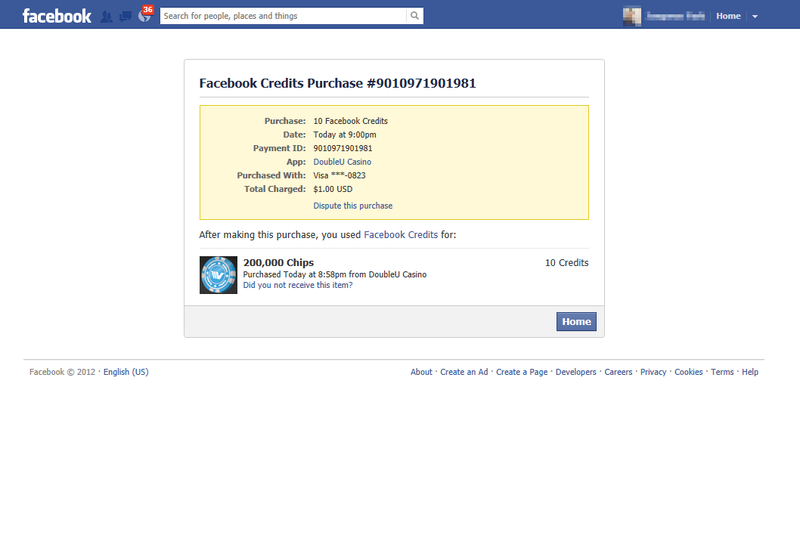 1) This scam page has "29" likes, much less than those of our fan pages. 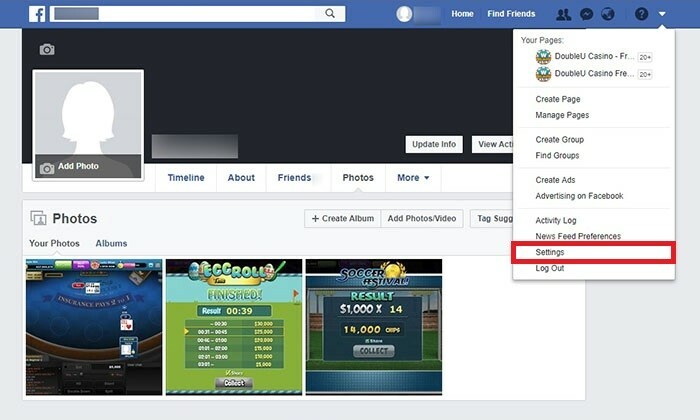 Also, the main titles of our fan pages are "Double U Casino - Free Slots, Poker, Blackjack and Baccarat" and "DoubleU Casino Freechips" each, different from the title of this scam page. 2) The picture below shows that it uploaded a post to hook DoubleU players. The URL leads you to a crude phishing app. 3) Both of our Fan pages DO NOT show the messages below. 4) This scam app entices you to fill out an useless survey trying to phish your account, or download rubbish files with virus or malware, so it is strongly recommended that you do not click any of links on these sort of scam pages. I accidentally "hide all" the posts from DoubleU Casino. How do I cancel it? Please go to your Facebook home page(news feed page), and you'll find "News Feed" menu on the left column. Then, you will see 3-dots button on the right side of "News Feed" menu. Next, click a "3-dot" icon(it's an edit option), and you will see "Edit Preferences" in the pop-up box. Click it, and you will see “Reconnect with people you unfollowed” and "Apps hidden from News Feed" in "See more options" menu. Click "doubleu casino", and you will be able to receive posts from DoubleU Casino. My payment process is stuck on "Order in process" message. Why? First, clear your web browser's cache and cookies(click to learn) and reload(refresh) the game. Second, try changing your payment option. 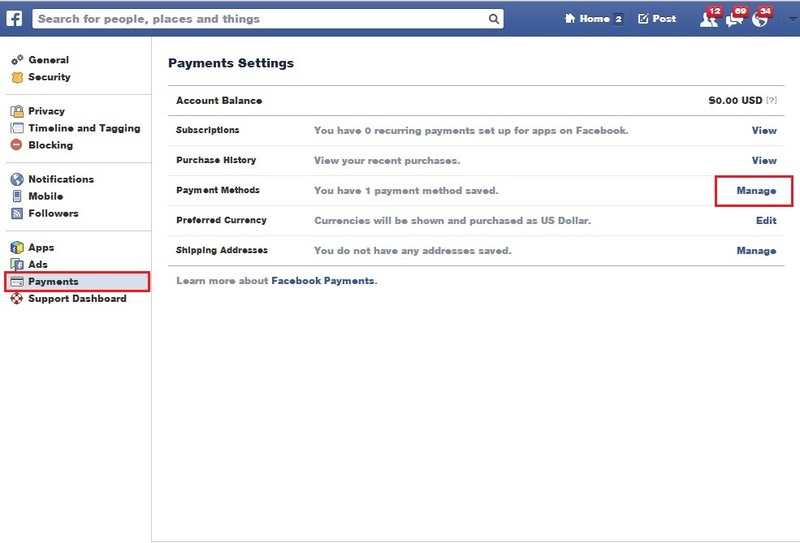 Please refer to the FAQ about payment options on Facebook Help Center to manage your payment options. 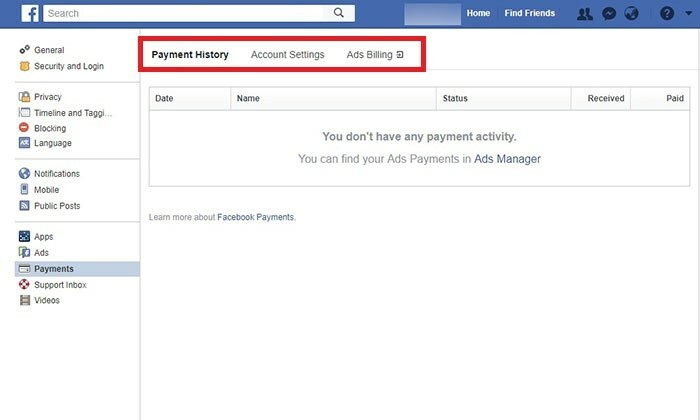 How do I check my Facebook payment methods? 1. 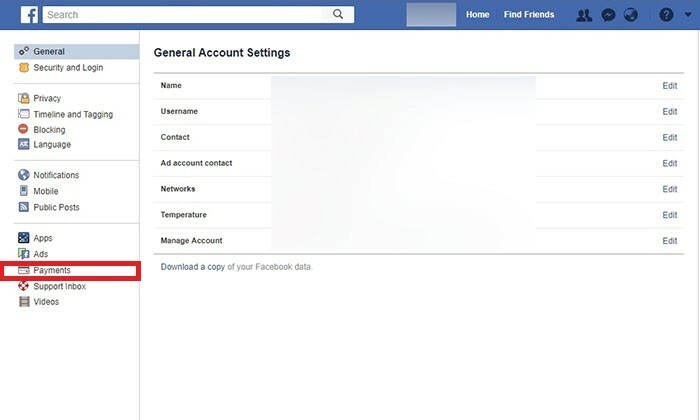 Click on "Settings"(new news feed) or "Account Settings"(old news feed). 2. Select Payments and click on "Manage" button.